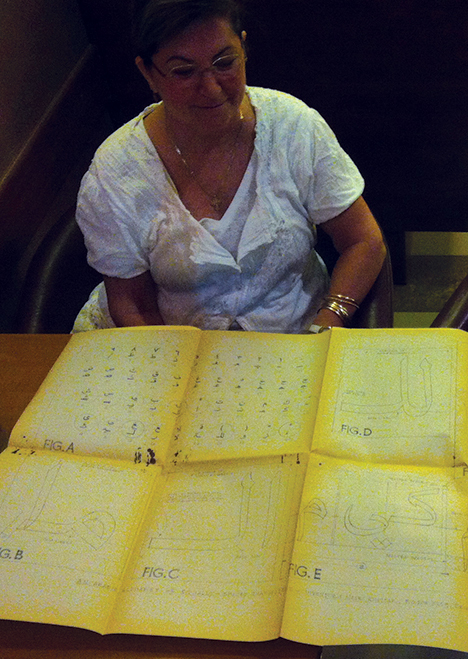 Last August in Beirut, I had the opportunity to meet with Camille Khattar Hedrick, the daughter of Nasri Khattar, the creator of a library of fonts based on Unified Arabic. Pascal Zoghbi: Hello Camille, it’s very nice to meet with you. Camille Khattar Hedrick: It’s a pleasure to be here today. PZ: So, what brings you to Lebanon? CKH: This is my second of many visits. I am organizing my father’s documents so as to make his designs available to the public. Here is Khattar’s earliest typeface, the first one patented, with space savings from almost non-existent ascenders and descenders. PZ: How did your father come to create Unified Arabic? Did he ever tell you, or did he ever document his creative process? 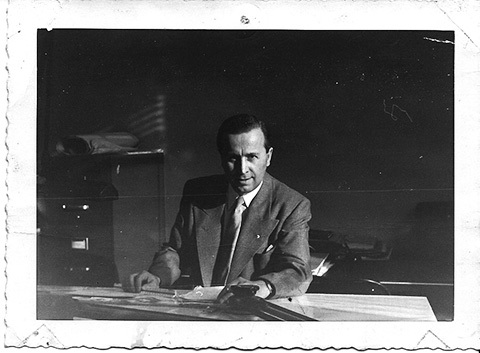 CKH: Just recently, I came across one of his writings called “How ‘Unified’ Arabic Came About.” In the early 1930s, after receiving his first degree in business from the American University of Beirut, and before traveling to the U.S. to attend the Yale School of Architecture, he taught a class in Arabic typing. This was the first time he had seen an Arabic typewriter and found it to be a “complicated” machine with an intricate keyboard. Each letter had several variant shapes, which meant that the keyboard had more than one key for each letter. During the typing class, one of the first words he typed was “ahlan-wa-sahlan,” meaning “welcome.” Doing so, he made a mistake, since he used the same key to type the two variant h’s appearing in this word. The mistake, however, led him to make a discovery: He realized that that the word was still perfectly legible in spite of the typing mistake. This was his breakthrough: The various shapes of each letter could be “unified” and standardized into one unique design and still be legible. Khattar had this poster made in the 70s to show both his detached and connected styles: He had just taken out a patent for his connected and unified typefaces. The patent states that the letter forms remain the same regardless of where they fall in the word – thus they are “unified” – and are also designed to connect. PZ: That’s truly amazing. Having come to this realization, what were his next steps? CKH: He immediately became determined to simplify the Arabic typewriter as well as Arabic type. He drew hundreds – if not thousands – of sketches of each letter formation. He didn’t stop until he reached the desired effect of legibility for each letterform. Description of the UA Neo Naskh Patent in 1950 in the USA. 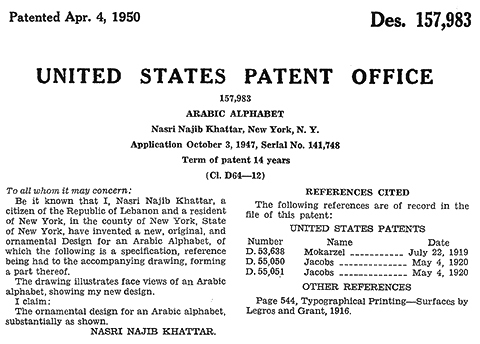 UA Neo Naskh Patent in 1950 in the USA. PZ: How long did it take him to have the unified alphabet ready to commercialize? CKH: You’ll note that he filed his first patent on October 3, 1947, and that the patent was issued on April 4, 1950. However, I have found correspondence between him and the patent attorney of the typewriter company, Remington Rand, dated April 15, 1935. He was already on his way although he was only 24 years old! 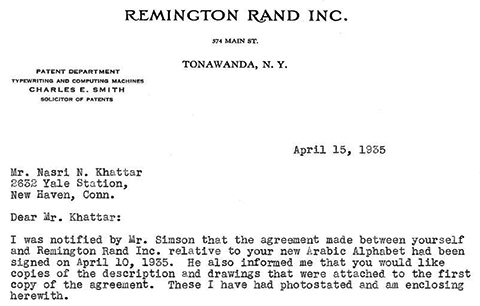 Letter dated April 15, 1935, from the patent department of Remington Rand, Inc., a prominent typewriter manufacturer, addressed to Nasri Khattar in New Haven, Connecticut, U.S.A., where he was enrolled in the Yale School of Architecture. PZ: Your father is known in books on the history of typography as the first person to suggest the idea of detached Arabic script and the unified glyph shape for each letter. But, from the drawings and documentation I’m seeing now in front of me, it is amazing to notice that Khattar’s thinking later evolved toward designing more traditional Arabic type. Tell me about that. 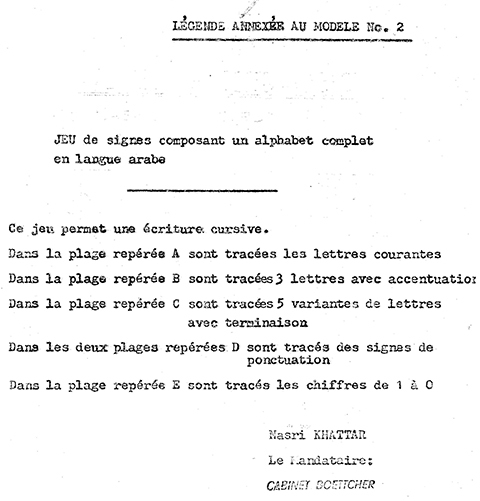 UA Kufic Patent in 1978 in France. 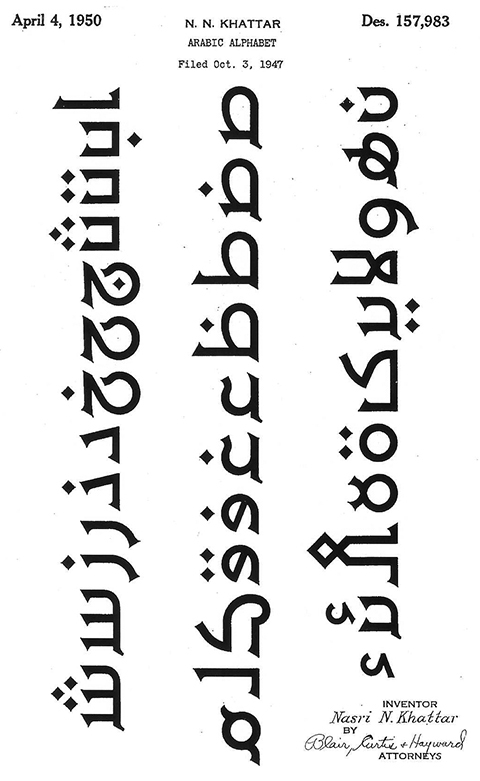 Description of the glyphs that are present in the UA Kufic Patent. A,B,C,D and E refer to the set of glyphs present in the patent. CKH: Yes, he worked for over 35 years on a variety of different font styles. In the 1970s, with the advent of the word processor, he knew he had to prepare for the computer age, and that the typewriter would soon be obsolete. About that time, I was working for a computer company called Digital Equipment Corporation, and, at my dad’s request, I made an appointment with their Arabic department. Before my eyes, a Lebanese programmer demonstrated how the computer was able to automatically create the glyphs. The age of the typewriter was over. It was a very sad day for me, and I wasn’t looking forward to telling my dad about it. I’ll never forget the look of amazement he gave me when I explained it to him. He said nothing, but I could tell that his mind was already racing with new ideas. He hadn’t given up. In this example, you can see that each shape is unified: The initial “meem” is identical to the medial “meem”, while at the same time; my father does make allowances for the “alif-laam” and the “alif-meem-laam”. In these drawings of a traditional font dated January, 1970, you can see how Khattar was continuously thinking about eliminating “wasted space,” – both vertical and horizontal – while making room for diacritic dots while to increase legibility. PZ: Your father was a pragmatic person who was trying to find solutions for the Arabic script amid limited typesetting technologies. What is even more interesting is noticing that he did not stop at the idea of detached Unified Arabic type, as I previously believed, but rather embarked on designing more standard fonts based on the traditional Arabic connecting script when he noticed that technology was changing from the typewriter to the computer. He grasped the limitations that were present as typewriter technology became obsolete and a newer advanced technology was emerging to allow for more detailed and standard Arabic fonts. Nowadays, some designers are still inspired or influenced by Khattar’s Unified Arabic type, and they are creating detached display fonts or designing Arabic logos with detached letters. On the contrary, the sad story is that some still consider that the future of Arabic script is to be detached, when the pioneer of detached Arabic type himself knew – as far back as the 70s – that the technology was evolving and catching up with the needs and requirements of Arabic script. Detached Arabic fonts will always be considered as a revolutionary approach for designing, typesetting, and reading of the Arabic script. We will be seeing this approached used again and again in the coming years, mostly from young graphic designers with radical attitudes. 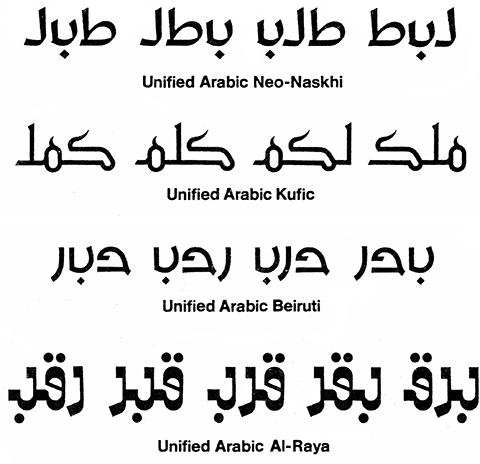 The Unified Arabic type concept will always be unique even though it will never be adopted as a new, universal approach for writing and reading Arabic. 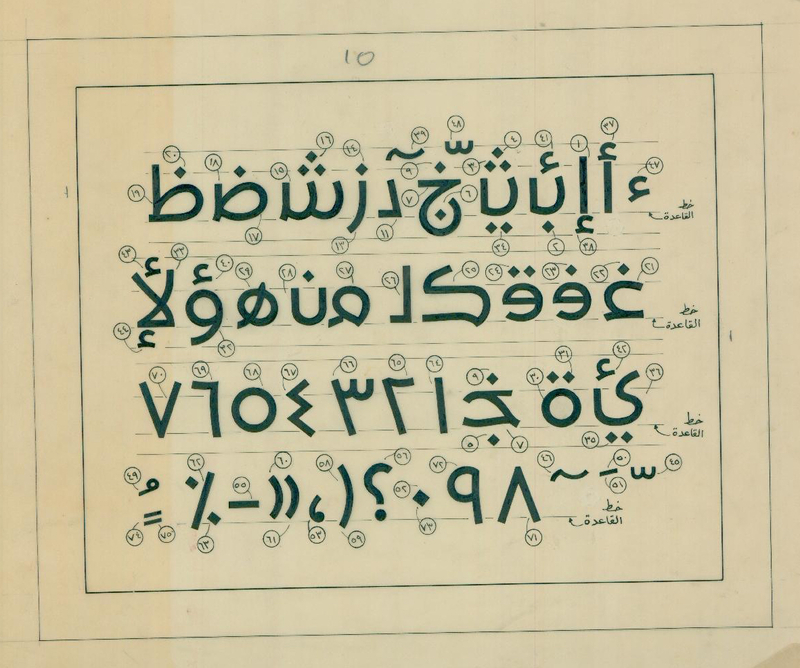 If you’d like to read more about the development of Arabic script technology and type design ideas beginning in the 30s and up to the present time, click here. Camille Khattar Hedrick, daughter of Nasri Khattar, showing her father’s work to Pascal Zoghbi in a café in Mansourieh, August 2012. CKH: Perhaps we could meet again to continue this discussion? PZ: Yes, next time we meet, let’s analyze other UA drawings to decide on digitization. Let me know when you’ll be in town again. 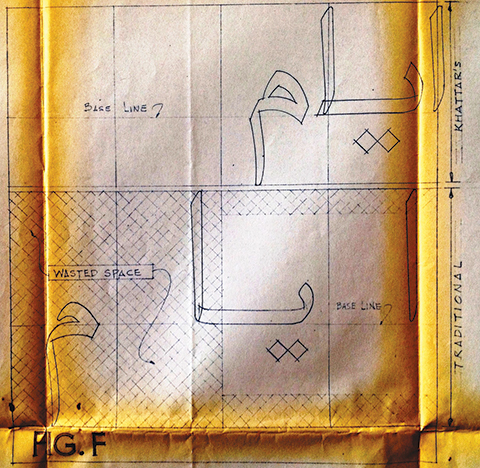 Excellent interview and useful, new material to shed light on an important pioneer of Arabic typography. Thank you Pascal and Camille for taking the time to present this information. I look forwards to read more. The new information and documents were also inspiring for me. I was not aware of the different designs of fonts he did and how he evolved in his way of thought threw out the years. Hello Mamoun! Thank you for your kind words. I will check out Emil Yaqoub’s book. My apologies…I meant to thank both of you: Hussein Alazaat and Mamoun Sakkal. Bonjour ! Il faut un début à tout, le contexte du temps (années ’50) été très conservateur. 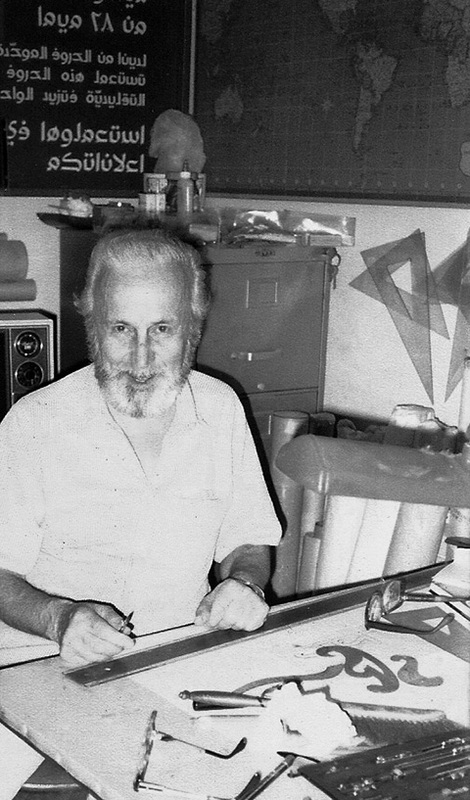 et l’imprimerie en général pas du tout évoluée Nasri Khattar, a mis au point son libre projet révolutionaire au moment où la Typographie été manuelle aidé par la machine (linotype) à faire des lignes monobloc limité au petit corps. Merci Pascal et merci à Camille K. pour cette pensée généreuse d’un homme qui a consacré de son temps pour aider le rapprochement des cultures. Bonjour Abdallah, tous mes remerciements pour votre commentaire so élogieux à propos de mon père. En effet, mon papa a consacré sa vie à son projet de l’arabe unifié – lettres détachées ou connectées – pour venir en aide aux peuples dont les langues sont écrites avec l’alphabet arabe pour les aider à avancer. Heureusement qu’il y a des hommes comme Pascal Zoghbi pour m’aider à raconter son histoire allant de la simple machine à écrire jusqu’au présent, l’ère de la machine numérique. you definitely have a point there, but i am not sure about the need to simplify the arabic script, or about our system of references when it comes to deciding on what simplicity is or should be… probably a long discussion, totally worth having though! i totally agree … now with this article we should reopen the debate … you guys are the type guru’s what do you think ? lecture, workshop ? ..
Nasri Khattar is a pioneer and a visionary. His work in terms of thinking and design is groundbreaking. Sadly, we haven’t yet got to witness the efficiency of this experiment in wide use. In some ways, to me, Mr. Khattar is to Arabic typography what Wim Crouwel is to Latin typography. His work is definitely an experiment that is worth following through. I hope Pascal is doing that! But I do have to say that on the question of simplicity, I have similar questions to Lara’s. Add to that the question of the whole history of development of the Arabic script which is one of the richest and diverse (and spiritual) arts. That is also a path completely worthy of following. This is truly fascinating! 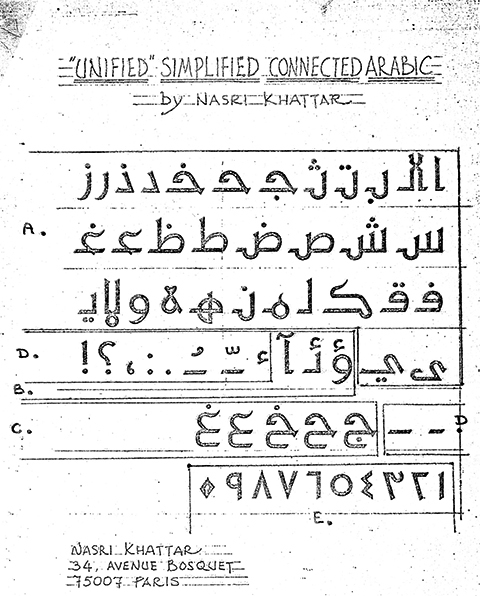 I never knew of Nasri Khattar’s work unfortunately, and always had a negative view of detached Arabic lettering because of my associating it with European type-foundries attempts to shoe-horn a complex, nuanced script into their technologically advanced yet limited technology. This really is a revelation for me. Especially now, as Camille said a younger generation will be exploring much more radical concepts. I devised a detached script that was incredible abstract, but not as a means to say this is how Arabic should be written, but more to emphasise that despite the ornate variety of characters, ligatures and alternates, there is a strong core aesthetic that makes this entire language legible across centuries of calligraphic development from Africa to Asia. Look forward to the second installment of this interview. Shoukran ya Pascal w Camille for sharing your findings. Thanks so much for your comment. So glad you discovered my dad’s work! Yes, Nasri Khattar never attempted to “shoe-horn” the Arabic alphabet (good word choice, “shoe-horn”) into any Westernized template. 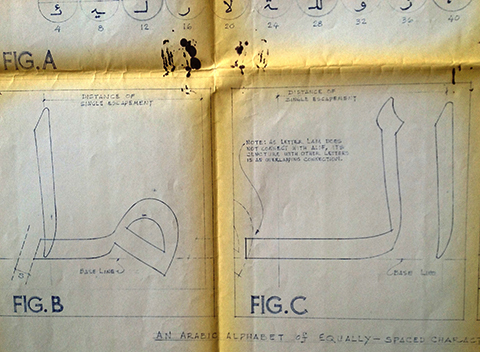 Instead, his goal was for his Unified Arabic type to *coexist* side-by-side with the cursive, connected forms. His desire was to assist the peoples of the world using the Arabic alphabet to be able to better communicate and thus advance in their development. He worked very hard, designing each letter over and over, to ensure that they would be legible by anyone in the Arab world. I remember people stopping and reading when they saw his type on marquees and signs all over Beirut. Also, as mentioned above, his later designs are connected and also unified: Each letter has only one unified form and is already designed to connect. 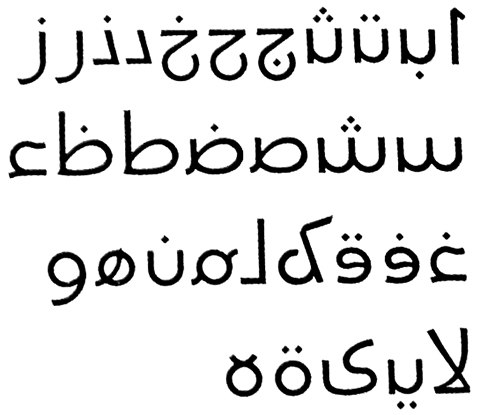 Digitizing these connected typefaces will be relatively simple since there will be no need to engineer any glyphs. Pascal and I will be working on those as well. Is the detached form you designed available anywhere? Could you supply a link? Nowadays, visionaries like Nasri Khattar are very hard to find in the arab world. The reason is simple, we live in a very complex world and anybody who attempts to do something about this subject has to have wide knowledge about language, science, technonolgy, history and philosophy. It is almost impossible for ordinary people to have a clear view about this subject. What is needed is a fresh and critical look at our language showing both its strenghts and weaknesses using modern technology. I have been doing research on this subject for about 30 years. I have just put the last touches on an exhibition about arabic typography, in a form of a a multimedia show, that comprises video clips, word games, data banks, electronic books, and of course new and revolutionary fonts. I hope that we will have the chance to meet with Ms Camille Khattar Hedrick, Pascal Zoghbi and others in order to discuss this very important subject. I saw your comment on Pascal Zoghbi’s blog. I am in Lebanon right now, in Mansourieh (El Metn) until November 8. Where do you live? Would you like to talk or meet? I will check your web site. +1 214-537-7999 U.S. Central Time but currently in Lebanon until 8 November.